City Hall in London hosted the formal launch of the first BYD fully electric double decker, which is due to enter service in the capital shortly. The vehicle has been designed and developed to TfL’s standards and specifications, with the Chinese manufacturer claiming it is completely emissions free. Although there have previously been examples of electrically powered double deckers, such as the Magtec repowered Dennis Trident in York, this is thought to be the first OEM electric double decker. The hand over saw Deputy Mayor of London for Environment and Energy, Matthew Pencharz, formally receive the first bus from MD of BYD Europe, Isbrand Ho. 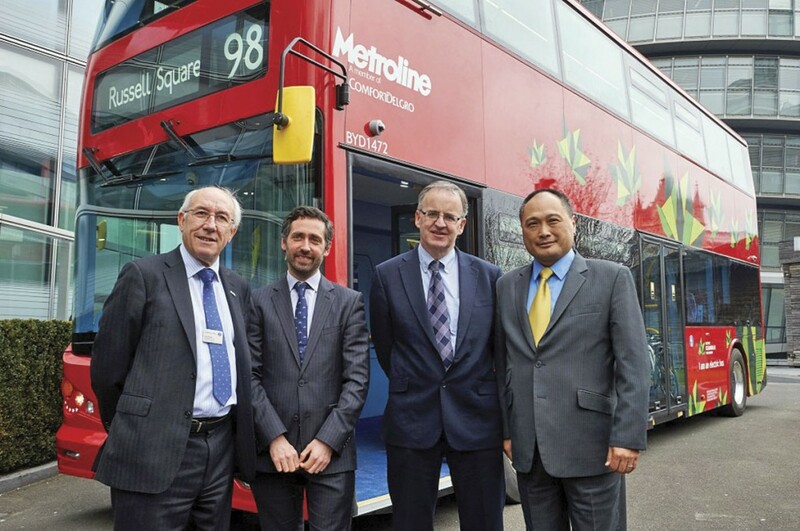 The landmark vehicle is one of a fleet of five, which will enter service on Route 98 operated on behalf of TfL by Metroline. BYD is working with these two organisations on an introduction programme for the vehicles, which includes driver training and the installation of fast charging equipment at the operator’s Willesden Bus Garage in north London. The 100% BYD designed and developed vehicle is 10.2m long, features full air conditioning and offers seats for a total of 54 passengers together with space for 27 standees. BYD says the Iron Phosphate batteries fitted to the bus store 345kWh of energy when fully charged giving it a range of up to 190 miles typical urban driving according to the internationally recognised SORT test conditions. Recharging takes four hours and can be completed overnight using low cost off peak electricity. This is more than enough to handle most daily duty cycles, according to the manufacturer. Even though it is the first BYD fully electric double decker, the capital is no stranger to the Chinese brand. Two pure electric BYD single deckers have been in successful trial service with Go-Ahead on TfL routes 507/521 for almost two years. Recently the manufacturer secured an order for a further 51 single decker electrics for operation by Go-Ahead. These buses, due to enter service later in 2016, are being developed in collaboration with BYD’s UK partner Alexander Dennis Ltd, which will undertake final assembly at its plant in Scotland.